I have watched every development of Kimberley since the day I conceived her till the day she passed on. We had spent the last 26 years of many ups and downs. The day when the doctor came to ward and said “ Hi, Mr. & Mrs. Lim, after a battery of test, I am so sorry to tell you that Kimberley has Stage 3 Colon Cancer! ” Suddenly, every part of my body became “frozen”. Who is to expect a bubbly, energetic, healthy, full of love – 23-year-old girl to have Colon Cancer. Till today, Colon Cancer is classified as a cancer for people over 50 years of age. Kimberley being diagnosed at such a young age has caught everyone by surprise. Every HOD in the hospital became her panel of doctors. Having a loved one battling cancer requires the love and support from the entire family. While we do not go through and endure the physical pain, during this period our loved ones need our emotional support the most. We have to learn to be their rays of sunshine when the outcome of chemotherapy treatments is not what we had desired. During the wake, many of Kimberley’s friends and strangers who were inspired by her blog came to pay their last respect. There was a stranger who came all the way after his night shift to pay his respect. Wow! What a turnout! Reality hit us after the day of Kimberley’s funeral. Our home was so was so cold and empty, no more laughter but it was as flooded with tears. The pain was so painful that even the strongest paracetamol could not ease the pain. While I was doing weekly grocery, I went to the toothpaste counter, took two tubes of Sensodyne. Upon reaching the checkout counter, I had to return back this toothpaste as I realised that Kimberley is no longer around to use them. I cried again. When we were out and upon seeing another mother and daughter, holding hands and laughing their hearts out, Sadness attacked me again! Losing Kimberley felt like my heart had been stab many times with a dagger. I prayed for God’s Grace to take away this unbearable pain. During this period of grief – family, relatives and friends were there for us to give their moral support and a shoulder to cry on. 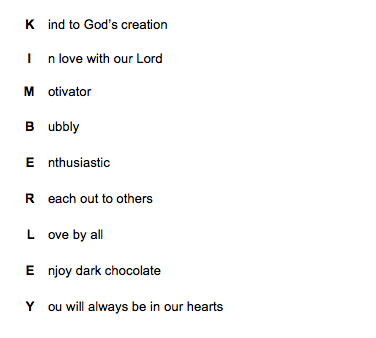 Our lives will never be the same again without Kimberley. There is a feeling of emptiness of not being able to hear her laughter or having any physical contacts. After crying our hearts out, we have to be resilient and continue to live our lives to the fullest in memory of Kimberley. While grieving for Kimberley’s death, we cried our hearts out but the memories we had with Kimberley would always be in our hearts. Having cancer, deepen Kimberley’s faith in Our Lord. Despite her tremendous pain, she never gives up on her faith. She always smiles and showers us with her love as if cancer was never in her body at all. That’s Kimberley – always put others before her. 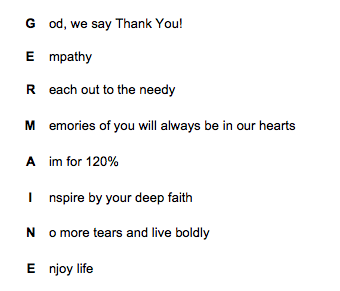 This poem also reflects on Kimberley’s passion and belief especially toward the elderly, whom she has known through her weekly volunteering work. Despite her condition, she strived to provide kindness and care towards these elderly friends till she no longer could. After a storm, a rainbow appears. Grief for a loved one is never easy. Certain days we will miss our loved ones even more than other days. These days are special events like birthdays and anniversaries. Do not feel ashamed that your tears have flooded your home, crying our hearts out is a form of healing. Patching up the hole in our hearts, bit by bit. I strongly believe that as much as we missed our loved ones, they too will miss us. Why? As you may ask. It is because we are family. A family goes through thick and thin together. After a period of time and we still have not move on, imagine our loved ones see us in this state. They will feel guilty that they are the cause of our grief and will not rest in peace. Rest assured that we would never forget our loved ones, as memories of them will always stay in our hearts forever. Life is short and Live Boldly. For the Lord will not clear the storms for you, but go through it with you.